Pacific Honda Blog: Lease A New 2012 Accord EX-L V6! 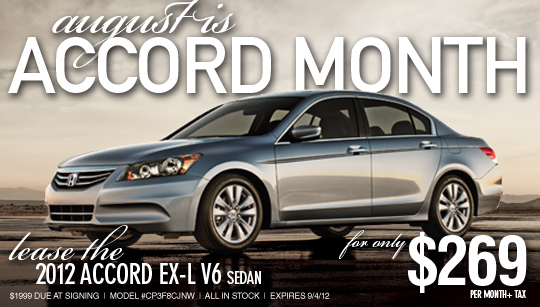 Lease A New 2012 Accord EX-L V6! Does not include government fees. Click HERE to find out more about this or other Accord models. The 2013 Accord Coupe is a Showstopper! Introducing the 2013 Honda Accord. 0.9% on Civic and Pilot Models! People Are Talking About The CR-V! Check Out Our Unbelievable Specials! Lease a new 2012 Civic EX Coupe!